(1, 4), (2, 3) and (5, 6) are three different pairs of identical figures. 1, 3, 9 have one element placed inside a different element. 2, 5, 6 contain two mutually perpendicular lines dividing the figure into four parts. 4, 7, 8 have two similar elements (unequal in size) attached to each other. 1, 6, 9, are all triangles. 3, 4, 7 are all four-sided figures. 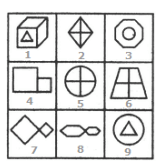 2, 5, 8 are all five-sided figures. 1, 2, 3 are figures composed of two straight lines. 4, 5, 6 are figures composed of three straight lines. 7, 8, 9 are figures composed of four straight lines. 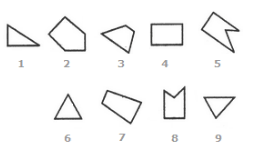 1, 4, 7 are all (two-dimensional) quadrilaterals. 2, 5, 8 are all three-dimensional figures. 3, 6, 9 are all (two-dimensional) triangles.